Max Congdon of Durango High School brings down Cauy Boulden of Montrose on Friday night. The Demons lost a barn-burner, 41-36. Dawson Marcum of Durango High School looks for open field while playing Montrose on Friday night. The Durango High School line blocks while playing Montrose on Friday night. 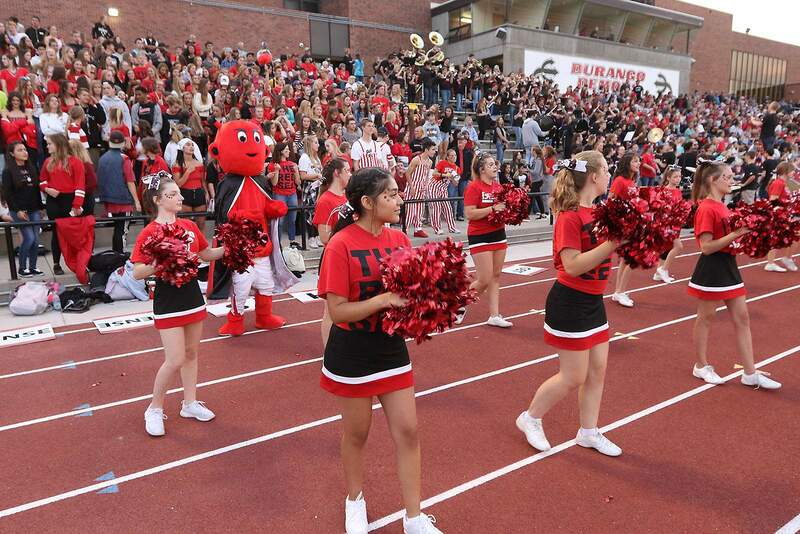 Durango High School plays Montrose on Friday night at DHS for their home opener. Everett Howard of Durango High School looks for open field while playing Montrose on Friday night. 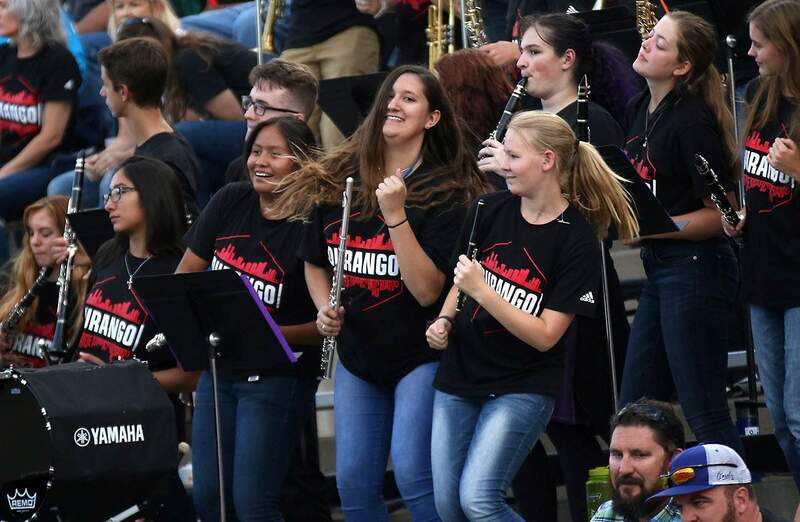 The Durango High School band gets in to the Durango and Montrose game on Friday night for Durango’s home opener. Durango High School and Montrose players line up for the National Anthem on Friday night for Durango’s home opener. A lightning delay after an interception hurt the Durango Demons, but it was the running of Montrose’s Chris Eckerman that left Durango thunderstruck in its first home game of the season. Eckerman ran for 220 yards and two touchdowns, as Class 4A No. 8 Montrose beat the Class 3A No. 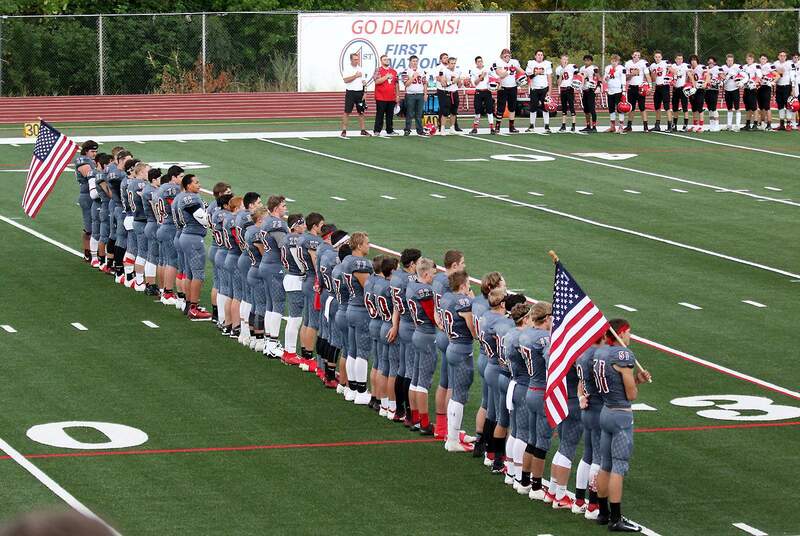 8 Demons 41-36 on Friday night at Durango High School’s stadium. 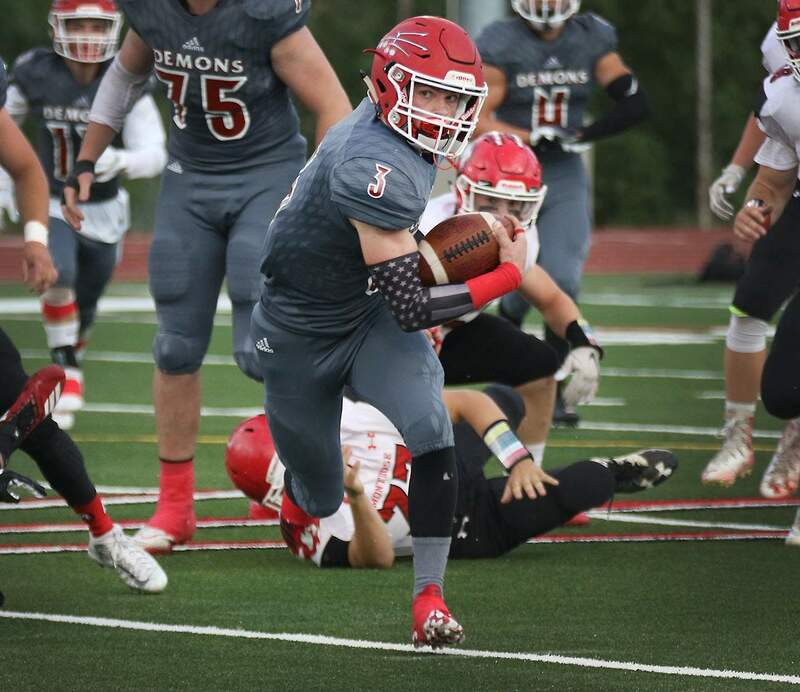 The Demons (1-2) took a 36-35 lead with 4 minutes, 25 seconds to play, as sophomore quarterback Jordan Woolverton hit senior wide receiver Alex Hise on a 36-yard touchdown pass to cap an eight-play, 80-yard drive. Instead of kicking an extra point to tie the game, the Demons went for a 2-point conversion. 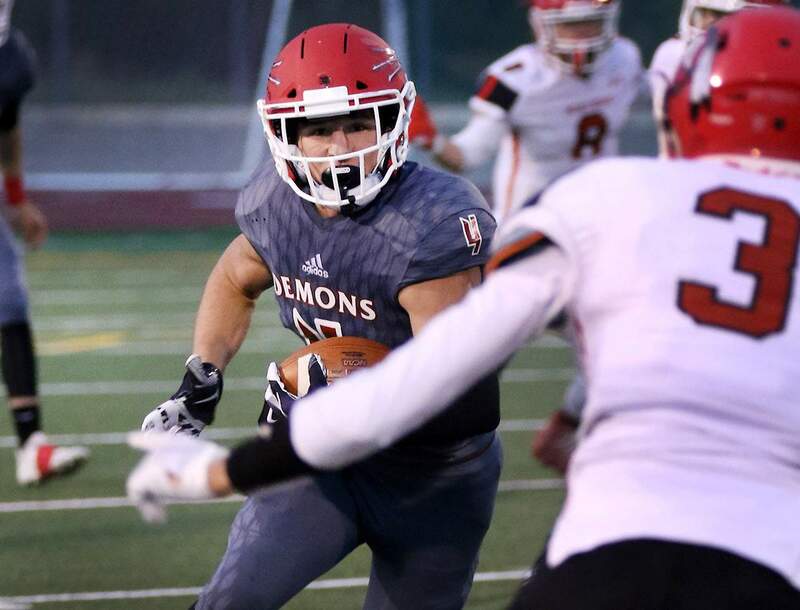 For the second time in the game, Dawson Marcum, a senior running back, completed a key halfback pass, this time to sophomore receiver Gage Mestas, to give the Demons a one-point lead. But Montrose marched down the field behind Eckerman and fellow running back Emmert Kastendieck. 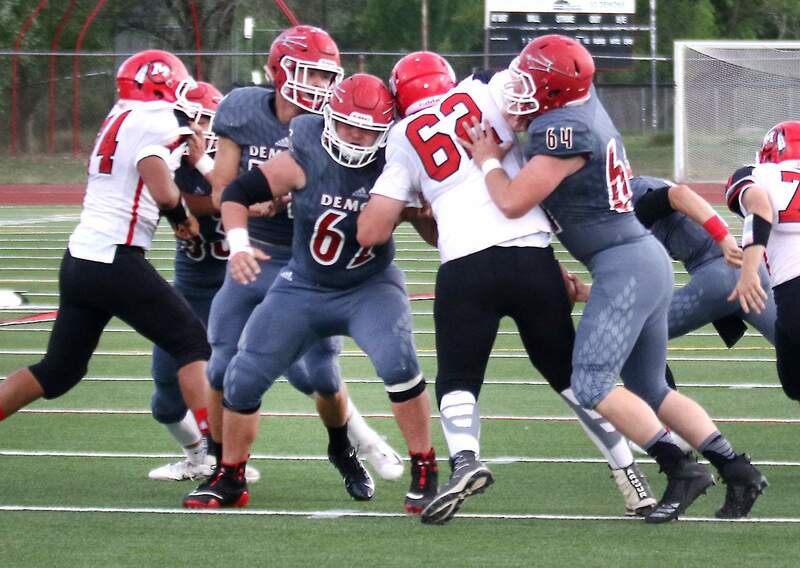 The Indians (3-0) went 80 yards in eight plays and scored on a 4-yard run by Kastendieck off the right tackle, as the entire Durango defense keyed on Eckerman up the middle. The score gave Montrose a 41-36 lead with 41.2 seconds to play. With no timeouts, Durango couldn’t mount a last-minute drive to win the game. “I think we just felt rushed,” Marcum said of Durango’s final possession. Woolverton finished 10-of-15 passing for 191 yards, two touchdowns and one interception. He also had one rushing score. Durango’s Marcum had a huge game with 146 yards and a touchdown. 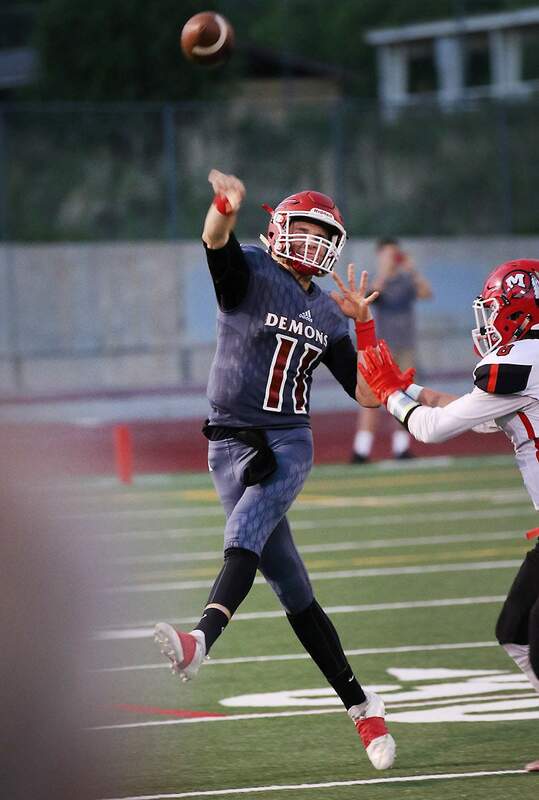 Montrose quarterback Keagan Goodwin, also a sophomore, was 7-of-12 passing for 127 yards and a two touchdowns, with all of his passes going to senior Cauy Boulden. Jordan Woolverton of Durango High School throws downfield while playing Montrose on Friday night. Durango’s offense clicked from the start Friday. 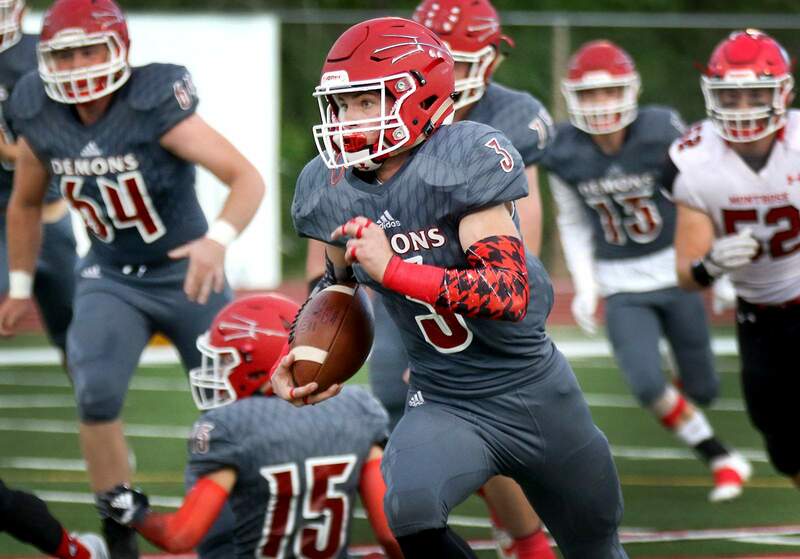 After Jackson recovered a Montrose fumble on the Indians’ opening drive of the game, the Demons marched 56 yards in seven plays and scored on an 8-yard run by Everett Howland. The Demons converted a key fourth-and-12 pass play with a 17-yard completion from Woolverton to Howland to extend the scoring drive. Montrose answered right back, though, as Indians quarterback Keagan Goodwin hit Cauy Bolden with a 22-yard touchdown pass. Bolden stiff-armed Durango’s Alex Hise and ran down the far sideline for the score to tie the game with 25 seconds to play in the first quarter. The 15-play drive spanned 81 yards. Durango would take the lead again in the second quarter on an eight-play, 67-yard drive that ended with a 12-yard touchdown run by Marcum. Woolverton made the extra point for the second time to give DHS a 14-7 lead. Montrose answered right back with a drive that went 80 yards in nine plays across 3:10 of game clock. This time, senior running back Chris Eckerman ran untouched up the middle for a 23-yard touchdown run. Eckerman totaled 98 yards, the touchdown and one fumble lost on 16 carries in the first half. “He was a tough, hard runner, but I think we were trying to take him from the top, not the bottom,” Marcum said of Eckerman. Durango wouldn’t go into halftime quietly, though. Facing first-and-23 from their own 22-yard-line with 1:08 to play in the half, the Demons called a gutsy halfback pass. Marcum floated a perfect pass to Jackson deep down the right sideline for a 62-yard completion. Woolverton led the team the rest of the way down the field, and he hit sophomore receiver Gage Mestas on a 5-yard touchdown pass with 10 seconds to play in the half to give Durango a 20-14 lead at the break. But turnovers cost Durango in the second half. 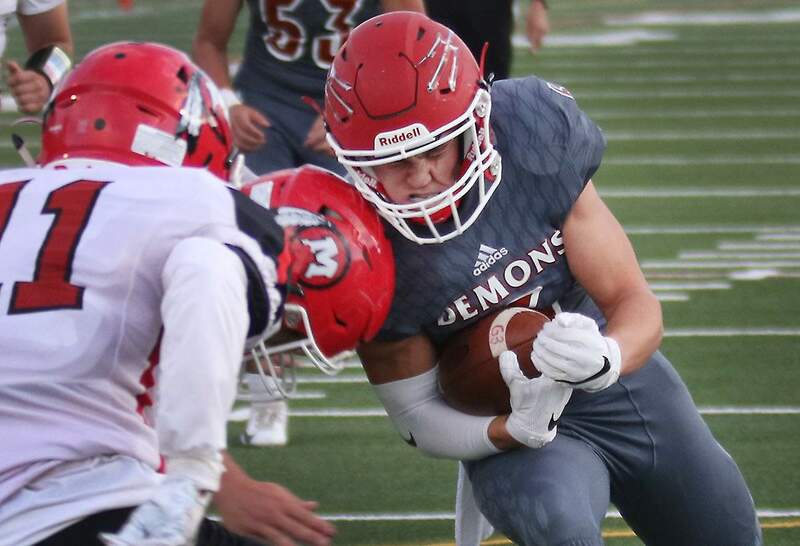 The Demons had the ball first in the third quarter, and a holding penalty away from a run up the middle cost the Demons a third-down conversion and led to a punt. Marcum looked to run for the four yards out of the punt formation, but he was smothered by the Montorse defense and fumbled. Eckerman ran five times for 33 yards for an Indians touchdown, and the extra point gave Montrose its first lead of the game at 21-20 with 7:04 to play in the third quarter. Marcum ran with fury on the Demons’ next possession with 40 yards on two carries. 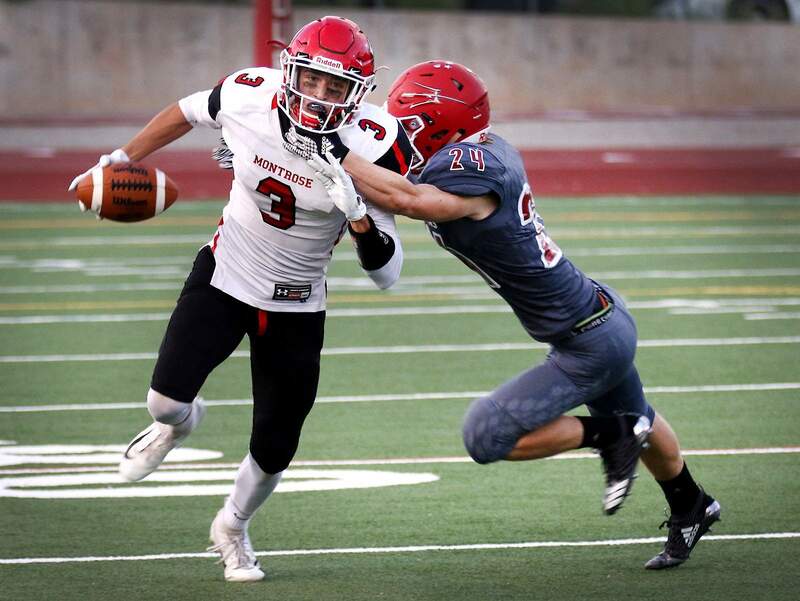 But Durango turned it over on a first-down pass play, as Woolverton was intercepted by Montrose’s Aaron Dietrich, who returned it to the Indians’ 35-yard line on the last play before the lightning delay. Breyton Jackson of Durango High School goes head-to-head with a Montrose player on Friday night at DHS. The Durango receiver was pushed before the ball arrived, but no pass interference was called. The ball bounced off the intended Durango receiver and into the arms of Dietrich. Immediately after the play, the game was delayed 30 minutes because of a lightning strike in the area. Montrose again made Durango pay with points off the turnover when play resumed. On the first play of the fourth quarter, Eckerman scored on an 11-yard run on a fourth-and-1 play, as Montrose took a 28-20 lead after the nine-play, 65-yard drive. Durango would answer with an 80-play drive that took only four plays. A 53-yard pass from Woolverton to Hise gave the Demons the ball on the 1, and Woolverton punched it in with a quarterback sneak the next play. Durango went for 2, and a speed option pitch from Woolverton to Marcum was good to tie the game at 28-28 with 10:08 to play. Montrose again marched down the field, though. Goodwin hit Boulden on a 40-yard touchdown pass, and the Indians led 35-28 with 8:29 to play. Durango’s go-ahead score gave the team energy, but the defense simply couldn’t stop the Indians’ rushing attack. Next, the Demons will host La Plata County rival Bayfield. The Wolverines won last year’s matchup en route to a 13-0 season and a Class 2A state championship. It was Bayfield’s first-ever win against the Durango varsity. DHS is 14-1-1 all time against Bayfield. “If we lose three in a row, then we’re gonna be in big trouble,” Vogt said.